systems, meteorological and flux measurement sites. The WindMaster is a precision 3D anemometer, offering Sonic Temperature, Speed of Sound and U,V & W vector outputs at 20Hz (32Hz option). 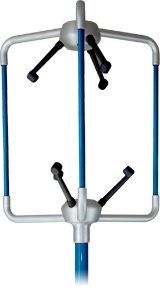 This 3D anemometer has an aluminium/carbon fibre construction and will monitor 0-50m/s (0-100mph) wind speed. The WindMaster Pro uses the same precision 3D measurement technology as the standard WindMaster, with an increased wind measurement range of 0-65m/s (0-145mph), 32Hz output as standard and a robust stainless-steel external construction.